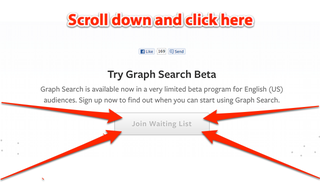 Facebook's Graph Search landing page is live now at Facebook.com/graphsearch. Unfortunately, this is not actually the live product but just an explainer. To get on the waiting list, head over to the page, scroll all the way to the bottom and click the "Join Waiting List" button. Facebook will notify you when it's your turn.